Join us for an evening of music, meditation, art and dance expiring and celebrating the consciousness or our allies in the green world. Patterns of Plants, composed between 1996 and 2011, is Mamoru Fujieda’s magnum opus. Working with the “Plantron,” a device created by botanist and artist Yūji Dōgane, the composer measured electrical fluctuations on the surface of the leaves of plants, and converted the data thus obtained into sound using the Max programming system. Through a process he has likened to searching “in a deep forest” for “beautiful flowers and rare butterflies,” he listened for musical patterns, and used them as the basis for composing short pieces, which he then grouped into collections reminiscent of Baroque dance suites. The resulting music is as varied and lovely as any garden. But it is more than ornamental; as pianist Sarah Cahill notes, these are pieces of great depth and expressivity. 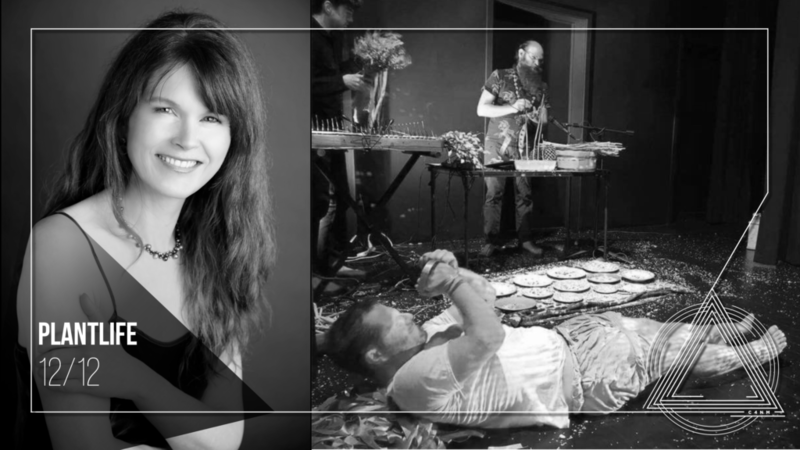 Psychobotanikon was collaboratively composed by instrument inventors Cheryl Leonard, Dan Gottwald and David Samas, all of whom have been working with natural materials for decades. It explores themes of plant consciousness, botanical perception of time and the voice of the plants themselves. Developed with live projection and dance to express the private life of plants and celebrate the interconnected sentience of every living thing. Plant Meditation with Michael Dooley and Katarina Countiss in the rehearsal room. The format is a headphoned experience for 4 people for 7-minutes for as many sessions we can do in an hour. Cahill’s radio show, “Revolutions Per Minute”, can be heard every Sunday evening from 8 to 10 pm on KALW, 91.7 FM in San Francisco. She is on the faculty of the San Francisco Conservatory, and curates a monthly series of new music concerts at the new Berkeley Art Museum. David Samas is a teaching artist, composer, instrument inventor, curator, conceptual artist and social sculptor. A queer, native San Franciscan from mixed immigrant roots, David got his a BFA from the SF Art Institute in conceptual art in 2000 and studied poetics at the New College of California. He is the director of Pet the Tiger Instrument Inventors Collective and curates the Window Gallery for Invented Instruments at the Center for New Music. Dan Gottwald is a sculptor, sound artist, instrument builder, musician and composer. Informed by desert landscapes, tools of industry, cartoons and tinnitus, his work focuses on the tactile, temporary and social through object, sound and performance. Gottwald’s main exhibition vehicle is the Analogous Ensemble, A collection of sound sculptures and instruments designed and built for the purpose of exploring new music and interactions between objects, performers and audiences. Lifelong dancer Christina Braun’s choreography with collaborating composers has been presented regularly since 2002. Her core teachers in the Butoh form are local treasures Hiroko and Koichi Tamano.